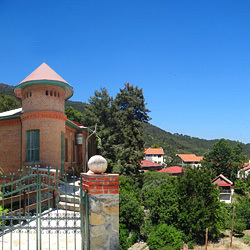 Entering the village, you find a large parking area, which was created to serve the village’s visitors. 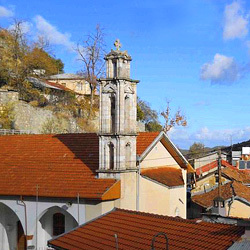 It is located next to the village’s Plaza, which is stone-paved. 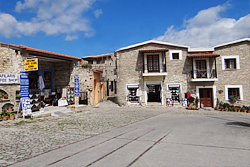 Around the picturesque plaza there are several shops selling the traditional (silk) embroideries of Lefkara as well as various other products. 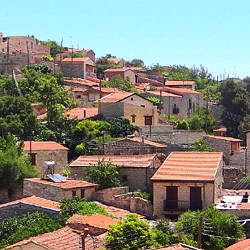 It's the starting point for all the little alleys of the village wich all are paved with stones and -combined with the old traditional houses. The “lefkaritiko” (lace embroidery of Lefkara) is the finest specimen that the needlecraft and the folklore tradition of Cyprus has to show. It is embroidery of great value that reflects the dynamism, the sensitivity, and the power of observation of the woman of Cyprus. The skilful hands of the needlewoman manage to create perfect and artistically delivered designs on the fabric, which not even the hand of the most skilful designer would have been able to deliver in such detail, grace, rhythm, and harmony. All the designs of the lace embroideries from Lefkara are inspired by nature and the environment, receiving a characteristic form as the stitches are combined. Today’s lace embroideries of Lefkara have evolved to a great extent, other -more recent -elements having been added to the stereotyped, old decorative, geometrical motifs. So, a huge variety of embroideries with characteristic names such as «athasi» (“almond”), «margarita», «makoukoudi» (refers to a small weaving row), «mi me lismonei» (“forget me not”), «tagiada» (a basic pattern in weaving), «potamos» (“river”), «arvalotos» (latticed / riddled pattern), «klonotos» (“branched”), «ammatotosς» (with eye-shaped patterns), «arachnotos» (“spider-web”), «aplos» (“simple”), «diplos» (“double”), «karouli» (“bobbin”), «miloudi» (“small apple”), and many more swarm the local and foreign market and become the main source of income for the skilful female weaver of Lefkara -the «kentitria» -and the male embroideries’ merchant of Lefkara –the «kentitaris». 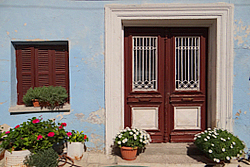 In the past century Lefkara has become world famous as the homeland of embroideries. 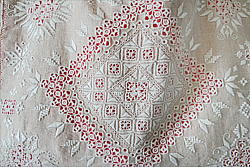 Indeed, the peculiarities and the technique of the embroideries that are manufactured in Lefkara have contributed to shaping a form of needlecraft with a special style that has now been established and named as «Lefkaritiko Kentima» (Embroidery of Lefkara) or simply «Lefkaritiko». Unfortunately, many of the old designs have stopped being produced -because of the difficulty in execution and of the time necessary for their manufacture -at the risk of a complete disappearance of the traditional needlecraft’s technique. Today’s ambition is to train and create perfect needlewomen by conveying in a simple manner the wealth of tradition, which was left as a legacy from generation to generation, and through everyone’s contribution to its continuance. 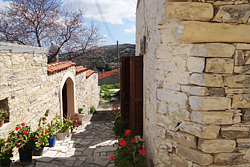 Wandering the beautifull alleys of the tiny village reveals good examples of the area’s architecture: houses built with horizontal layers of limestone interspersed with pebbles. 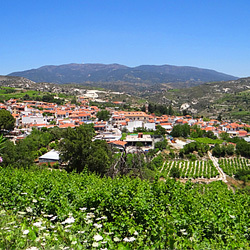 There is a wonderful view from the tiny church of Archangelos in the field below the square. The church houses some superb 12th century frescoes. 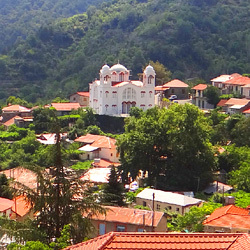 Apart from its famous lace and silver work, Kato Lefkara village is also well known for its architecture. 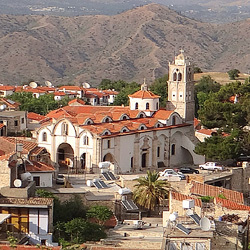 It is one of the few villages in Cyprus where the houses are built almost entirely of local white stone, which contrasts beautifully with the terra cotta roofs. 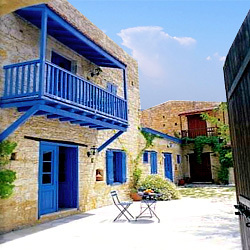 The houses here are not those of farmers but the homes of merchants and artisans. 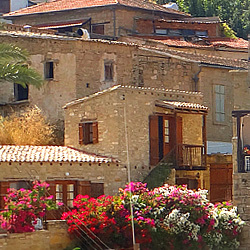 The houses are stone-built, some with doorways providing glimpses of flower-filled and vine-covered courtyards, while others are two-storey colour washed residences with balconies and intricately patterned tiled floors. 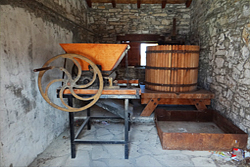 Located between the Water Fountain (Havouza) and the Panagia Eleousa Church, is the old preserved olive-press of the village which the inhabitants used to produce their olive-oil in olden times. In the north end of the paved area you can view the stone made old fountain. 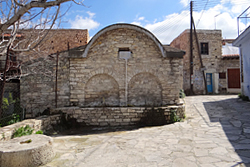 The two taps of the fountain were used to supply water to the women of the village, needed for their daily chores. 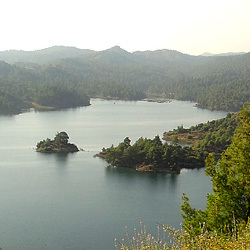 A side trip to Dipotamos Dam, which is a popular angling site and where birdwatchers can often see black storks and pelicans. 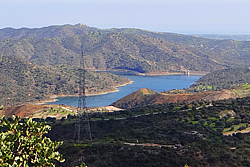 Dipotamos Dam, whose construction finished in 1985 in the Larnaca area, has a storage capacity of 15,5 million cubic metres capacity. Today the craft of the silversmith & the goldsmith in Cyprus combines the long tradition with the modern trends and conceptions. Specimens of this modern art are presented in well-established, annual exhibitions. 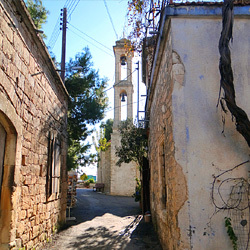 At the same time, the Cypriot folkloric craftsman – silversmith still exists in Cyprus. 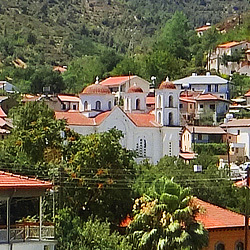 Unfortunately, today only one such craftsman –silversmith works in Kato Lefkara, working silver in the traditional way of the hammer (forging) and manufacturing the traditional Cypriot, ceremonial items –such as the censer, the holy-water sprinkler, and several other folkloric art items. 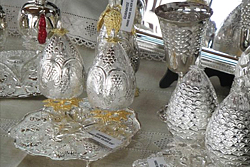 It is probable that the silversmith’s craft first appeared in the region of Kato Lefkara in the beginning of the 18th century. 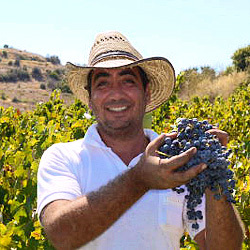 The above conclusion is reached due to the testimony of the history researcher Aristeidis N. Koudounaris and based on the dating of the collection of old silver-items that he has (buckles, bracelets, ear-rings, and crosses that he purchased from the known Jewish goldsmith of Larnaca, Leon Algazy, items which came from the region of Lefkara). Indeed, as the same person stresses, the silverware items were coated with enamel. 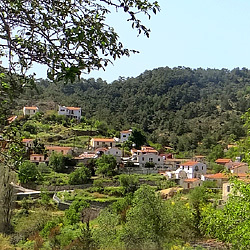 The craft of laying enamel, which also goes back deep into ancient times, seems to have also been known to the inhabitants and the silversmiths of Lefkara. 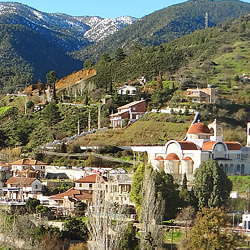 Besides, from the entries in the «CODEX» of the church of “Stavros” one reaches the conclusion that silver ecclesiastical vessels such as oil-lamps were made in Lefkara in the middle of the 18th century (1742). Moreover, they brought over a craftsman from Rodos along with his apprentices and constructed the icon-screen as it now appears -chiseled –as well as the throne of the priest, the High Altar, and a silver oil-lamp with the expenses paid by the church. 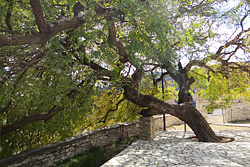 In the courtyard of Panagia Eleousa Church you can find the massive oak tree amidst the picturesque scenery, where visitors may go and enjoy it's shade. The forest depart has placed this tree under it's protection and is responsible for sustaining it.